Over the last month, rumors have swirled that Google might revoke free access to their most important tool: the Keyword Planner. What makes this change so important? It helps qualify a PPC campaign. Without free access to this tool, you wouldn’t be able to properly test and execute your campaigns. It helps identify SEO opportunities. If people are paying for traffic, it’s worth putting SEO effort into a keyword, too. 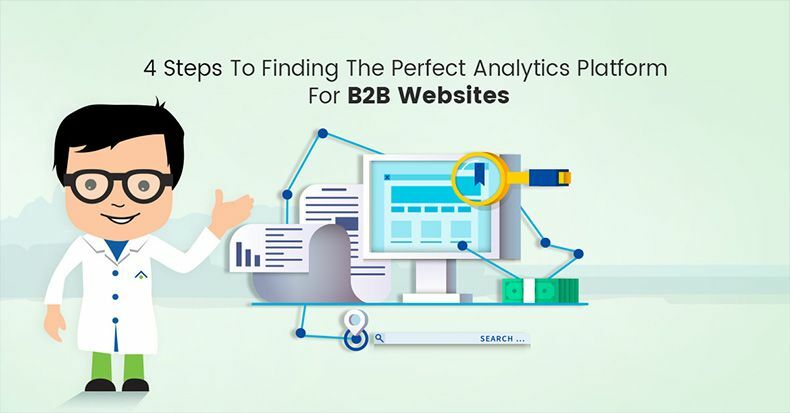 Whether you do SEO or PPC, you need to know how your customers are looking for you. 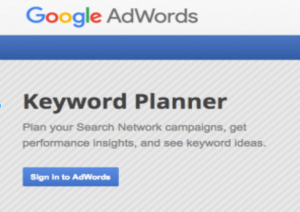 The Keyword Planner helps show you which words people search more. This helps you learn which phrases offer bigger opportunities for growing traffic and customers. Aren’t as good as direct data from Google. Sure, Google is sampling their data as they present it in the Keyword Planner but that’s still better than the sampled data from third-party sources. They are expensive. Third party tools that provide search volume numbers will charge you. How dare they! It’s like they have mortgages to pay, or something. 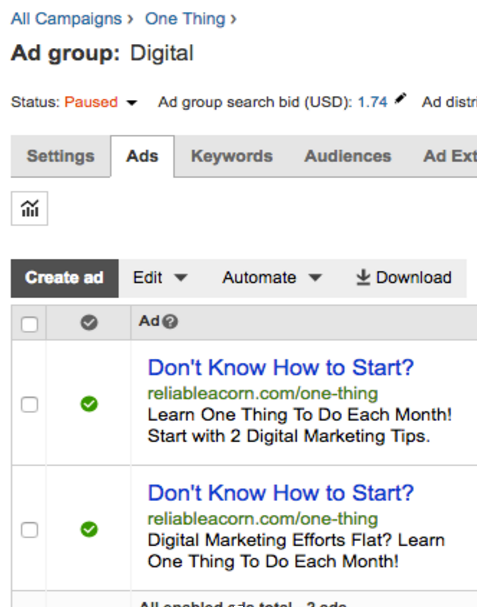 So, as long as we’re going to have to pay for keyword research data, I had a thought: Why not start a PPC campaign? I figured that I’d have to spend, at least, $100 a month for a good keyword tool. I took that budget and started a small PPC campaign. Create a campaign and set your budget. If you want to know how many people search within your area, limit your campaign. The budget I tested is $100 per month (divide by 30 to get your spend per day). That’s not a lot of budget but this is just a test, right? ID your test phrases. This will be a limited test, so just pick a couple (3-5) broad phrases for which you’d like to see data. Convert to modified broad match phrases. That means adding a plus (+) before each word. You don’t want to use Phrase Match here – that’s too specific. Broad Match is too broad. Modified Broad Matches will make sure you have relevant phrases but enough flexibility for the experiment. Create an Ad Group for each phrase and set your bids. First, set all your bids the same. For now we’re just interested in which phrases are more popular than others. We’ll return to change these bids later. Create a couple ads for each Ad Group. This is your opportunity to test your messaging and conversion rate. Make sure you follow all best-practices for your ads such as keywords, incentivizing clicks, relevant landing page, include a call-to-action, etc. One of the common frustrations with Google’s Keyword Planner are the Search Volume estimates. This number is often misunderstood. Search volume is an estimate. Notice how the numbers are always rounded? That should tell you this isn’t a real number. It’s an estimate. Search volume is not traffic. I’ve seen some people try to estimate website traffic from this data. The number Google is giving you is an estimate of the number of people searching for a phrase. Only a small number of those people will actually see your website (become an “impression”). Of those, even fewer will click your ad (become a “click” or “session”). Search volume depends on the phrase you enter – sort of. Lately, Google is including slight variations within one phrase. That means the data is not limited to that exact phrase but phrases it considers close-enough. With these limitations, search volume data from the Keyword Planner is still useful. It helps you compare phrases against each other. It tells you that more people search for “this phrase” rather than “that phrase.” With that information, you can set your content priorities, rather than waste time with words or phrases for which people aren’t searching. 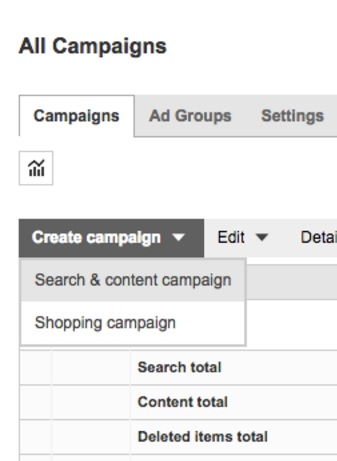 You can also do this with a small PPC campaign. After running these campaigns I quickly learned the phrases for which people searched more often than others. One of the reasons I learned this fast: my limited budget was so small the ads weren’t being served. Now that I know which of these searches are more common, I can determine which should be my priority for my SEO campaign. I also have a realistic expectation of which are more difficult to achieve than the others. Some people use Google’s Keyword Planner for long-tailed keyword ideas. I’ve never found this particularly helpful. Frequently, Google’s suggestions are irrelevant. I’ve always brainstormed my own list with help from tools like ubersuggest or keyword.io. Thanks to my PPC test I was able to get some great keyword suggestions. Once I started to get some clicks from my ads, Google was willing to tell me the phrase users searched. That gave me some great long-tailed keyword ideas I could use on my page. It also gave me some good suggestions for other pages. A significant limitation of the Keyword Planner has to do with conversions. Sure, I might see a lot of people looking for a keyword. If I get some of those searches to come to my site, I’ll get some visitors. Will those visitors ever become customers? Google has no idea. My PPC test told me. Eventually (and it’s slow because my budget was so small here) my ads produced some customers. Awesome! Now I know which phrases not only have search volume but which can help grow my business. SEO might be a slow process but now I know which phrases have the potential to give me more leads from SEO. Another way of looking at this: for each customer I get from my PPC keyword test, the cheaper my tool becomes. These conversions end up paying for the test. Beat that Third-Party Keyword Tools! 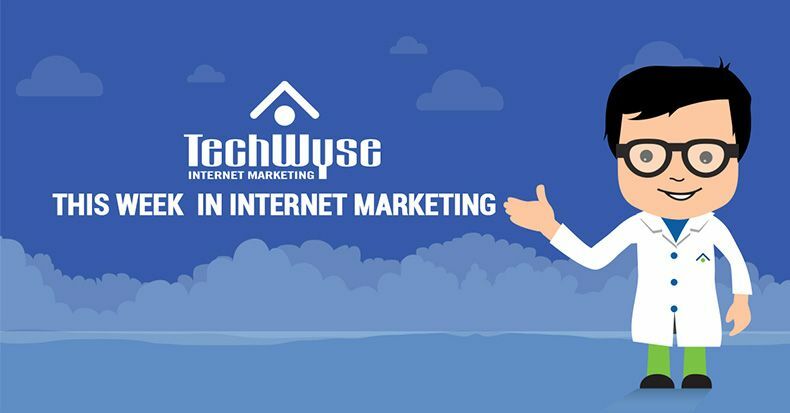 They don’t know what to do, when it comes to online marketing. They don’t have the time to put an effective internet marketing campaign in place. I tested these messages by writing two sets of ads, for each Ad Group. From there I could see which one was more likely to produce a conversion. This gives me benefits outside of online marketing. It helps me write my own elevator pitch. Now, the next time I only have 20 seconds to describe my business to a prospect, I know what to say. BingAds is Better than AdWords – Maybe. Confession time: I am someone who uses “Google” as a synonym for “search.” I’m also an SEO who almost only looks at data from Google. That’s short-sighted, I know. Considering those facts, now you know how hard it is for me to tell you: I did this PPC test on Bing, not AdWords. 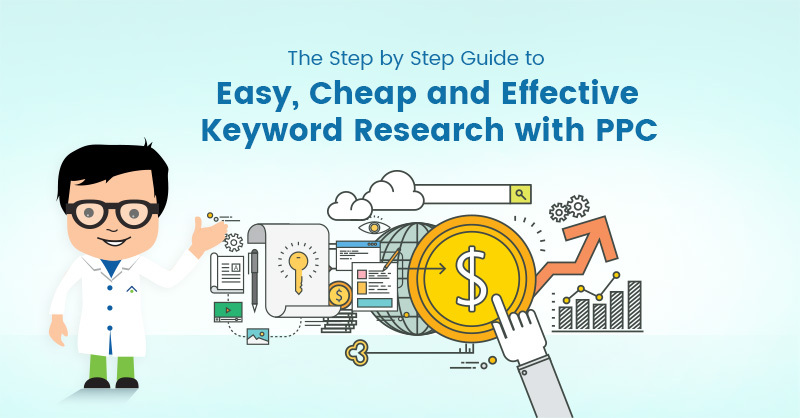 Bing is a better solution for my PPC keyword research method because it is a lot cheaper. I found the cost per click on Bing was one-fifth what I could spend on Google (at least for my phrases). That allowed me to spend more money and get more data faster. Sure, Bing has a fraction of Google’s search market share, but that doesn’t matter for this test. I still know which phrases people search for more, and which are more likely to convert. I was also able to test my message. One limitation might be due to the nature of Bing users. There might be such a fundamental difference between their user base and Google’s. If that’s true, my data could be completely invalid. That’s the risk of using Bing here. Despite this potential limitation I’m happy with my results. I now know the most popular keywords in my niche. I know which keywords produce potential customers. I also know the message to which these customers respond. It was better than any other keyword tool I’ve ever used. Try it yourself – I think you’ll agree. David Zimmerman is an internet marketing consultant. He started Reliable Acorn in order to provide a small number of clients the best advice available. When he's not in front of a screen, you might see David hiking in the foothills of North Carolina.